Do Gadgets Make Good Dentists? A prospective patient came by one day to interview me. She was looking for a new dentist for her family. She and her husband were intelligent people and owned two successful businesses. This woman was doing her best to select a good dentist for her family- or so she thought. The questions she asked centered on what expensive gadgets I had bought for my office. Did I have digital x-rays? Did I have a laser? How about one of those expensive CAD-CAM machines that makes crowns while patients wait? Sorry to say, I am a conservative business owner who is leery of incurring debt to buy expensive and unproven equipment. I must have disappointed this woman, as she did not return. Doubtless she found a dentist with most of the expensive gadgets she thought were standard for good dental treatment. It is unfortunate, but a lot of people think many expensive gadgets = quality dental care. This is in no small part due to manufacturers’ propaganda. In the high-overhead professions of both medicine and dentistry, it is a hard sell to get docs to buy expensive new equipment. Nobody wants to be an early adopter who spends $50,000 on an invention that doesn’t live up to its expectation. So the trend is to first advertise any new expensive technology directly to patient populations. Without a professional background and access to scientific journals, it is easy for the average patient to be convinced that some new gadget is the greatest thing since sliced bread. The next step is for manufacturers to post an online list of dentists who bought their product, so patients can view and patronize these practitioners. In this way, manufacturers seek to reward dentists who make a large purchase of their new equipment. Am I against new technology? Absolutely not. My problem is that much of it does not work out to be practical or economical. Someone has to pay for this expensive stuff. Invariably it is the patients via higher fees. It is instructive to look through the “For Sale- Used” ads in my dental journals and see what is available. Invariably I encounter expensive items that were highly touted three to four years prior, but did not end up being a worthwhile investment. These gadgets sell used for pennies on the dollar. Would digital x-rays save my patients radiation over my top-notch film and equipment? Not much, if any. Intraoral digital x-ray sensors are uncomfortable in the mouth and cannot be sterilized. The chief convenience is immediate reading by the dentist. How about spending thousands of dollars for software to trace and measure parameters of skull x-rays for orthodontics? It would save me time, but considering the fact I analyze about eight such x-rays a year, would it make sense? Hand tracing and measurement take me a little time, but the result is just as good. Would investing over $100,000 in a CAD-CAM machine to make crowns in the office do better than my lab technicians? Not from the examples I have seen. And the crowns still have to be custom-stained to look authentic. But again, it is convenient for the dentist not to have to schedule a second patient appointment for cementation. Would a $40,000 laser work magic on my patient’s gums? Well, it is not true that patients don’t need anesthetic injections before using lasers. These machines cut very slowly, and stink when they do. The only convincing use I have seen for lasers is to cut gums around implants, where my electrosugery unit cannot be used. In dentistry at least, lasers seem like expensive toys. By now I am sure you get the picture. With high enough patient volume, there are a few technologies that sometime make sense for a practice. These are few and far between. For every technology that proves itself in medical or dental practice, there might be nine that disappear because they do not live up to expectations. In dental and medical practice, if you don’t get diagnosis and treatment planning right, no technological marvel in the world will make up for it. Technology is no substitute for experience in surgery. The main effect of technology is to increase doctor productivity. In general, the number of high-tech gadgets in an office is not a good indicator of quality of treatment you will receive. Many of us have significant others in our life that snore. Many these people also have mild sleep apnea. At the minimum, they make life difficult for others in the household. At the worst, they may be adding an additional risk for heart disease. Many people cannot tolerate the CPAP machine. It may be overkill for mild sleep apnea anyway. For these people, a simple oral device that advances the lower jaw to clear the airway might be just the thing. It takes a sturdy appliance to hold a patient’s jaw forward all night long. In our experience, the Thornton Adjustable Positioner (TAP) appliance is the best of the bunch. Not only is it sturdy, but its adjustment features allow each patient to find the perfect advancement position for comfort and effectiveness. I used this device to reduce my own snoring for several years before orthodontics. Once my braces were off, I procrastinated about having a new one constructed, until my wife complained enough. Finally I had the current improved version of the TAP constructed, which is much more comfortable. My wife reports my snoring is down significantly. These things are not cheap. All totaled, they cost $1200. If you have had a sleep study, there is a chance that you may get your medical insurance to cover a portion of the cost. Not everyone is a candidate for an intraoral sleep appliance. Almost all natural teeth must be present to anchor a device like the TAP. It is not possible to wear when undergoing orthodontics. For those who can wear them, however, oral appliances may offer relief to the snorer and loved ones who try to sleep in the same house! “Aren’t those silver fillings you put in people’s mouths poisonous?” Patients ask me questions like this weekly. They think they might be victims of an unsafe filling material, but they are instead victims of self-serving fear mongers. There is so much misinformation about health issues in the news media, it is no wonder many patients are confused. It seems like the purpose of reporters is to scare us to death with sensationalism, rather than to inform us. Silver amalgam fillings were placed by the Chinese as early as 1400AD, and in Western countries since the early 1800s. This material has saved countless of millions of teeth from extraction. 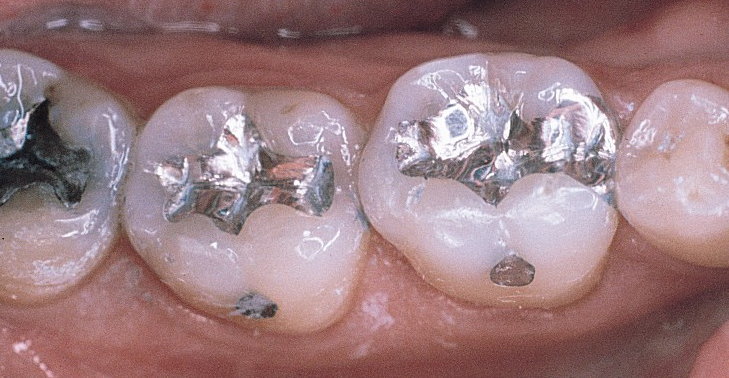 Silver amalgam is economical, easy to place, and durable. Current formulations are about 59% of a mixture of silver, copper, and tin, and 42% mercury. “Mercury! Isn’t mercury a poison?” This is always patients’ next question. Yes, if you ingest elemental mercury or sufficient amounts of methyl mercury, it is. Many common everyday items contain amounts of dangerous elements, bound together in stable molecules. Elemental chlorine gas is lethal if inhaled. Bound together with sodium, it is the table salt you ingest in food every day. It is true, silver amalgam contains mercury, but it is bound together in a stable alloy that poses no health risk. Silver fillings have been the subject of countless scientific investigations. Although it is true that trace amounts of mercury are released in heavy chewing, the amounts are inconsequential and have not been found to pose a health hazard. Eating fish, especially tuna, releases more mercury in your body than do silver fillings. The most elemental mercury is released from silver fillings during their placement and during their removal from teeth. Now think about this: my assistant and I remove old silver fillings and place new ones in teeth during much of our workday. If silver fillings are so dangerous, don’t you think dentists and their assistants would be the people who were very ill? Now why on earth would people try to scare you into thinking fillings in your mouth are poisoning you? There are two reasons- publicity and money. Please examine people’s motives before you believe what they say. If one researcher concluded that drinking tap water was a dangerous health risk, it might make headlines on the news. If ten researchers concluded that drinking tap water was safe, do you think you would hear about it? No- It wouldn’t be news, because it would not be contrary to what anyone believes. It wouldn’t scare anyone, nor generate any publicity! For a researcher, claiming silver fillings cause a variety of serious illnesses is a sure way to be an instant celebrity. It also gains publicity for his university employer, which increases the researcher’s chance of promotion. Likewise, if a dentist tells you that your silver fillings are safe and should stay in your mouth, he will earn no money from you. However, if a dentist acts unethically and claims your silver fillings are toxic hazards and should be replaced, he stands to make money from replacing them with more expensive types of fillings. Think about it! Where is the motivation? Two beautiful new and polished silver amalgam fillings, alongside an older amalgam on the left. Amalgams like these may easily last 20 years, and often 40 years in the mouth. Now that we have gone over all the reasons why amalgams are safe, why should you consider using them in your mouth, instead of types of fillings? Amalgams are cost-effective. They have the lowest cost per year of useful life of any filling material. They are easy for the dentist to place, even when there is moisture. It is relatively easy to get a good contact between a silver filling and an adjacent tooth. Inadequate contacts can cause food impaction and gum disease. Post-op sensitivity is usually minimal and short-lived. Silver fillings actually seal better with increased time. They are more decay-resistant than resin-based or resin-cemented fillings. Silver fillings can be repaired or added to. The amalgam material is not so hard that it wears the opposing natural teeth. Silver amalgam fillings remain the most durable filling material for back teeth after gold. Gold fillings are wonderful, but are more complicated to do, and cost several times as much as silver amalgams. Science has made great improvements in white resin fillings, but such fillings still do not last nearly so long in back teeth. It is not rare for silver fillings to last 30 years, and it is possible for them to last 60. There is no reason why you should have silver fillings replaced for health reasons. How to select a dentist? That is a good question. What is really important? Is the dentist honest? In the old days, patient selected professionals from affiliations in churches and civic organizations. You picked a guy that acted honestly in his public dealings. A guy that would cheat on his wife would probably try to cheat you in billings. Sadly, people think choosing professionals this way is passé. Is the dentist competent? What good are low fees if treatment is done incompetently? Competency should be your next criteria. Dental lab technicians can tell you in a heartbeat which dentists turn in the best work. But it may be difficult to get a technician to talk to you about this subject. Any general dentist who is a member of the RV Tucker Gold Study Club (very active in Oregon), the Academy of Operative Dentistry, or the Academy of General Dentistry are probably very competent dentists. Public records of your State Dental Board are an invaluable resource in screening dentists. See if you Board has any disciplinary actions against dentists in your area for either dishonest or incompetent practice.. Look for actual consent orders against dentists. Not just complaints, as any disgruntled patient with a balance can lodge a baseless complaint. Is the dentist reasonable in fees? Naturally, you will find the highest fees in upscale parts of town. Be aware that if you seek dentists with expensive gadgets like lasers or CAD/CAM machines, you will pay higher fees! But the biggest way you will save money is by seeking a general dentist who does most work in-house. Former military dentists are likely to do more specialty procedures. Ask a prospective office if the dentist does most root canals, difficult wisdom teeth, and implants himself. Fees by general dentists are usually less than fees of specialists. Is the dentist more interested in his profession or the money his profession brings? A good indication is membership in state and local dental societies, as well as the organizations listed previously. Beware of the professional fascinated with the expensive things in life outside the office. It’s pretty easy to pick up on this in conversation. Ask a technical question about procedures, and a dentist interested in his profession will talk your ears off. You want a dentist who is truly fascinated by his profession, not one who merely views it as a means of income. How not to select a dentist! Preferred Provider listings- A great way to select against dentists with high ethics. Yellow pages ads- Anyone can say anything in a phone book ad. Courts have blocked professional associations from policing deceptive or misleading print advertising. Referral from manufacturer’s websites- Manufacturers of expensive gadgets like lasers advertise to the public, and infer that any dentist with one of their expensive products is “state of the art.” They give free patient referrals on their websites to dentists who purchase their products. Expensive gadgets are nice toys, but ultimately have little effect on the quality of treatment. Anyone who advertises themselves as a “Cosmetic Dentist.”- There is no such recognized specialty in the profession. Anyone who advertises themselves as a “holistic” dentist with a “metal-free” practice- You will have a scam artist for certain.